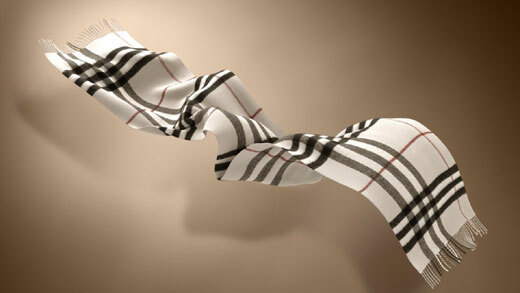 The softest, highest quality cashmere is the foundation of the iconic Burberry scarf. Defined by the diameter and length of its fibres, the cashmere is taken from the goat, with each producing enough raw cashmere to create one scarf. On arrival at the mills it is rigorously tested using a traditional hand-combing method to ensure it is of a high standard. Their cashmere scarves are made at distinguished mills in the towns of Elgin and Ayr, using a mixture of processes both by hand and machine. Cashmere is carefully woven on a traditional loom, washed in fresh local waters and finished by skilled craftsmen using expert methods passed down through generations. 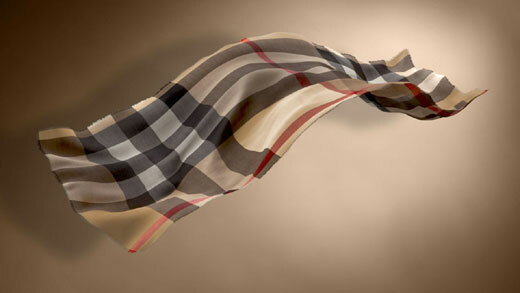 Today, Burberry's cashmere scarves are recognised around the world and embody values of design, craftsmanship and innovation. Discover the new service, The Scarf Bar. Allowing you to create your own scarf from over 30 colours, patterns and runway-inspired prints, designed in the Burberry studio in London. Camouflage and animal patterns were seen in the Autumn/Winter 2015 runway collections on bags and outerwear while heart and dot designs were shown in past seasons. Our iconic check features in a unique scale and is available in a large selection of colours. The original check in camel, black and ivory first featured as a trench coat lining and has been a badge of honour since at least the 1920s. 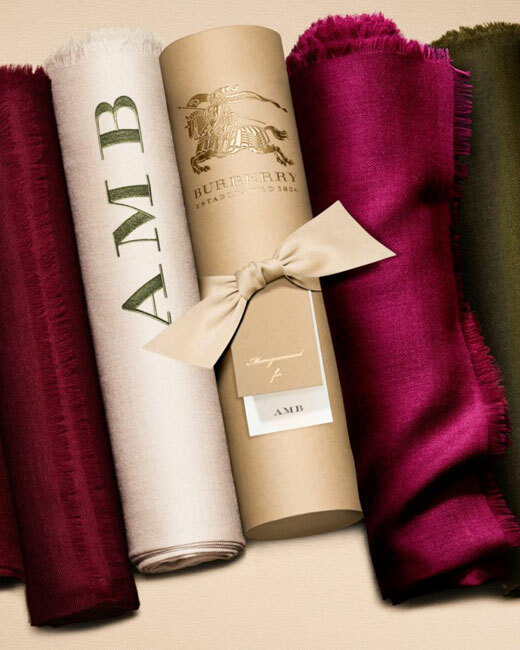 Their cashmere scarves feature as part of our in store and online monogramming service, perfect for gifting. All styles are available to monogram with up to three personalised initials in over 30 complementary and contrasting thread colours, ranging from classic tones to seasonal colours. 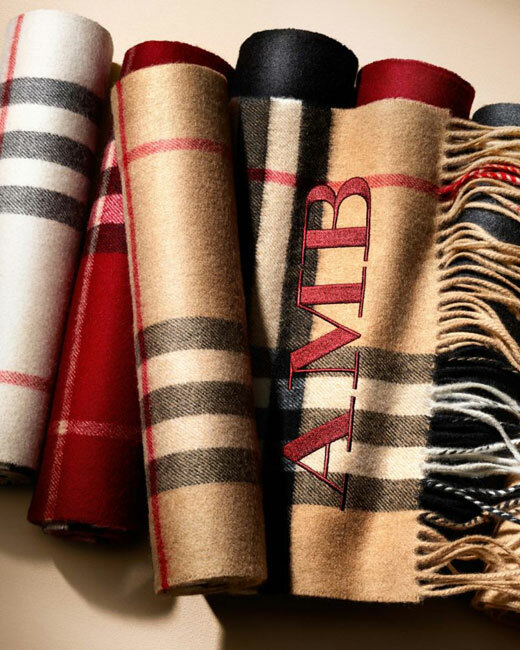 Two different font sizes can be used to monogram your scarf. Each scarf is carefully packaged in a trench-coloured cardboard tube, inspired by the cotton gabardine fabric that is used to make our heritage trench coats. Made in England, the tubes feature a matching ribbon and are embossed with the gold Equestrian Knight emblem. 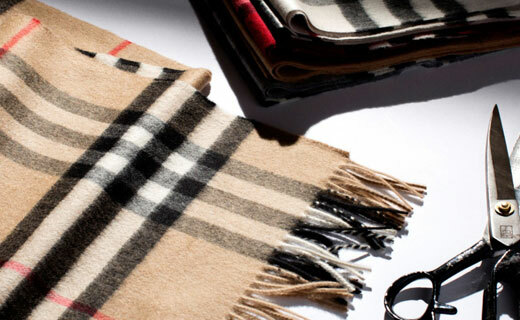 Monogrammed scarves include a personalised paper tag with the initials of the recipient for the perfect gift.